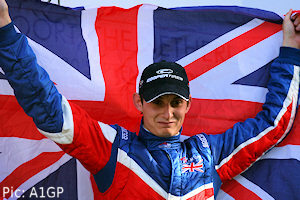 The collapse of A1GP’s Team GBR in April left driver Oliver Jarvis owed nearly £170,000 according to figures filed with Companies House outlining the state of its finances. The records, filed in April and May, show administrators working towards liquidating the company after a bid to work out a voluntary arrangement with its creditors did not come to fruition and its franchise agreement was terminated. They demonstrate that former director Tony Clements estimates that he and his partners put more than £8 million into keeping the team afloat, covering annual running costs of £2.5 million that included a £1.25 million fee for the A1 team franchise. They say: “Mr Clements states during 2008, given the downturn in the world economy, the team began to run short of funds. Sponsorship monies had not been able to be sourced for the 2008/09 season and the shareholders had insufficient funds to continue to subsidise the team. The company running the team, A1GP (UK) Limited, was found to have assets of at most £34,000, comprising items such as IT equipment and tools – and liabilities in excess of £7 million, including substantial sums owed to Tony Clements and his partners. A statement from Clements explains that the original aim was for himself and his partners to advise on financial planning and overseeing the company while British Formula One and motorcycle champion John Surtees acted as team principal. But Surtees left the team in August 2007, to concentrate on his other business interests, including the racing career of his son Henry. Katie Clements, daughter of Tony, took over the role and held it until the termination of the team’s franchise. Tony Clements is revealed to be owed more than £3 million from the company after investing his own money in keeping it afloat, while daughter Katie, former team principal and also a director, is owed £100,000. Tony Clements had also put more than £12,000 of series costs on his own credit card and was owed nearly £21,000 in expenses. Considerable sums of money were owed to various companies connected to the A1GP brand – including £52,715.15 to A1GP Hospitality-Sterling and £149,392.78 to A1 Grand Prix Hospitality Ltd, £10,000 to the Dubai-based A1 Grand Prix, and £221,545.19 to A1 Grand Prix Operations Ltd, a UK limited company which is currently being wound up by the High Court after an application by a creditor. Driver Oliver Jarvis was owed £37,871.14 in prize money plus a further £129,009 for unspecified reasons and £1,200.57 in expenses. Oliver Turvey was owed £429 and Robbie Kerr £1,883.47. However rookie James Winslow, 2006 driver Darren Manning and 2009 drivers Danny Watts and Dan Clarke do not feature in the creditors’ list. By far the biggest creditors’ claims outside of Tony Clements’ have been made by Wade Cherwayko and Tunde Folawiyo, founders of the team alongside Clements in 2004. Cherwayko, who is the A1 Team Canada seatholder, is an oil tycoon with a keen interest in motorsport and is claiming £2,121,622.49 personally as well as £4,333.79 for the Canadian team. Folawiyo, a Nigerian businessman with interests in oil, gas, shipping, agriculture, property and engineering, is claiming £899,621.18. A number of British motorsports and related companies feature on the creditors’ list, including Arden International Motorsport Limited (£2,748.17), sports management company Eden Rock Sports Limited (£14,100), Trident Racing Supplies (£1,117.85) and The Motorsport Industry Association (£1,404.13). Substantial sums were also owed to travel and marketing companies. The failed company left behind a tax bill of more than £3,000. Categorised under A1GP, News, tagged under A1 Team GBR, A1GP, A1GP UK Limited, Katie Clements, Oliver Jarvis, Tony Clements.